Cherry Blossom Festival: Japan is very famous for its amazing cherry blossoms. To celebrate the blooming phase of cherry trees, cherry blossom festival or Hanami is observed in Japan and around 27 other countries. Cherry blossom trees bloom for not more than 2-3 weeks every year that signifies the eternal truth ‘nothing lasts forever’. Japanese sakura a.k.a. cherry blossom festival is a blend of traditional rituals with contemporary recreational ideas. Tea ceremonies are organized under cherry trees where people with their friends and family gather around. The Sakura festival weeks which often named as ‘Golden week’ have become a famous south-east Asian tourist attraction. Other than Japan perhaps the most eventful cherry blossom festival is celebrated in the USA. In the year 1912 Mayor Yukio Ozaki of Tokyo City presented 3000 cherry trees to the city of Washington, D.C. to celebrate and strengthen the bond between Japan and USA. USA’a cherry blossom festival pays homage to that friendly event. 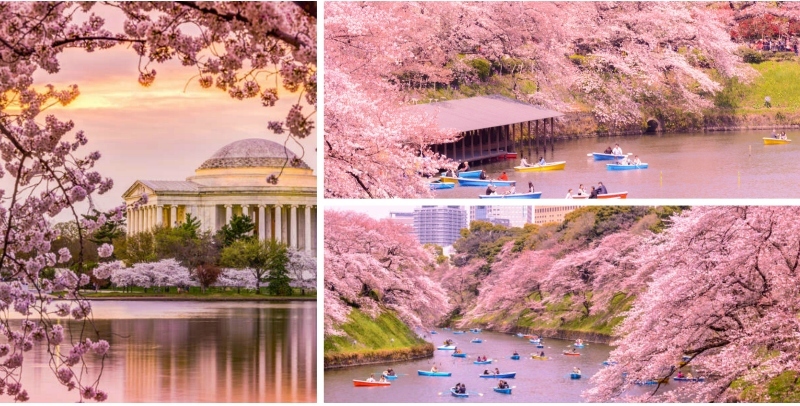 This springtime festival is observed every year in the months of March and April when the tidal basin area of the Potomac River near Washington, D.C. decorates itself with pink cherry blossoms. Currently, American Sakura festival is held for four weeks. National Cherry Blossom Festival Parade is a spectacular event among the celebrations. This parade runs 10 blocks in the constitution avenue, D.C. from 7th to 17th block. People from all over the states gather to enjoy this festive parade with colorful floats and helium balloons. Various cultural meets and performances are also organized in this parade where popular entertainers perform. The pageant of the cherry blossom festival is also quite famous. In Indian climate, Himalayan cherry blossom bloom in autumn months. In November 2018, India has celebrated its third Cherry Blossom Festival in Shillong, Meghalaya. It was a 4-day event that showcased the pink-white cherry blossoms around the Ward Lake along with exotic Indo Japan cuisine and cultures.